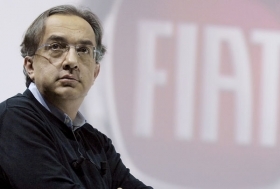 CEO Marchionne expects Fiat to sell up to 2.3 million vehicles units globally in 2011. TURIN – Fiat-Chrysler will increase sales by 12 percent to more than 4 million vehicles this year, Sergio Marchionne, who is CEO at both automakers, said Thursday. If it succeeds, Fiat-Chrysler will prove that the alliance in on track to meet Marchionne's ambitious plans for the two automakers. The CEO ultimately wants Fiat-Chrysler to sell a combined 6 million cars by 2014 as he firmly believes that anything below the 5.5 million to 6 million units a year threshold makes it impossible for a mass-market automaker to thrive long term. This year Marchionne expects Fiat S.p.A. to sell between 2.2 million and 2.3 million units globally, up from 2.08 million in 2010, the CEO told an analyst call on Jan. 27. At the Detroit show earlier this month, Marchionne forecast worldwide 2011 sales at Chrysler Group LLC to exceed 2 million units, up from 1.59 million in 2010. Those two predictions add up to more than 4 million units this year compared with 3.66 million units last year. A number reached after the elimination of double-counted sales. A gross total of Fiat sales would have doubled-counted about 14,000 sales of Chrysler, Dodge and Jeep models sold in Europe by Fiat after it became the U.S. automaker's general distributors in the region in September 2010. Fiat reported its sales and financial results on Jan. 27. Chrysler will report its numbers on Monday, Jan. 31. Fiat raised its Chrysler holdings to 25 percent from 20 percent this month after the U.S. automaker won approval to build fuel-efficient engines in Dundee, Michigan. Fiat will get to increase the stake to 35 percent this year if it: records a total of $1.5 billion in sales outside North America; obtains agreements from 90 percent of its dealers in Latin America to carry Chrysler products; develops a compact car on a Fiat platform that will achieve 40 mpg (5.9 liters per 100km). Marchionne has said he expects all those requirements to be met this year. The conditions are tied to a deal with the federal government that allowed Fiat to rescue Chrysler from a U.S.-steered bankruptcy in 2009. Once all the conditions are met, Fiat has an option to boost its holding to 51 percent -- but only after Chrysler repays U.S. and Canadian government bailout loans.